AMD today has officially released specs and the listing of graphics cards that are being rebranded to the OEM-only RX 500X series. For all the rumors and speculation that abounded around a super-charged, maybe even Vega-sprinkled new Polaris architecture from AMD has seen their dreams of interesting times squelched unceremoniously. What were before expected reports have now been rendered true: these are nothing more than an OEM-specific rebrand of AMD's RX 500 graphics cards. They're just direct rebadges - not a single MHz was increased across the entire portfolio, except for one lonely graphics card: the RX 550X has apparently seen a bump in clockspeeds, from the RX 550's "up to 1183 MHz" to the RX 550X's "up to 1287 MHz). Aside from that, folks, move along: there's nothing to see here. The only people disappointed from those are those foolish enough to believe every little rumor. A refresh wasn't on AMD's roadmap. They are simply bumping up clocks for OEMs as their process becomes more mature. C'mon AMD, you could have thrown in at least a 570 mobile part. I actually did LOL, superb. Great, that RX 550X has 512 or 640 shaders. I bet that it's pure luck which one a buyer will get. So you didn't read the article, which states "not a single MHz was increased across the entire portfolio". They will be OEM parts so it's up to the laptop/pc manufacturers to point that out. These parts will vary based on power envelopes and/or price. This is what AMD and Nvidia both do to suit the tight requirements of mobile systems. And you did not read where it pointed out the single exception. It's massively rude to try and criticise someone for doing something you in fact have not done. I did. I ignored it because it's not relevant. So this whole "renaming" scheme is meant to mislead OEM buyers to believe they are getting new upgraded graphics cards? Also looks like Windows 10 do not haw drivers for x300 gpu also. OEMs, who employ engineering teems who embellish AMD's chip with stuff will not notice that specs have not changed, seriously? Stop Blaming AMD guyz,..it was not their fault.. They did not hype.. they didnt even create a press release..or anything ..
in fact, AMD never spoke a word about it. 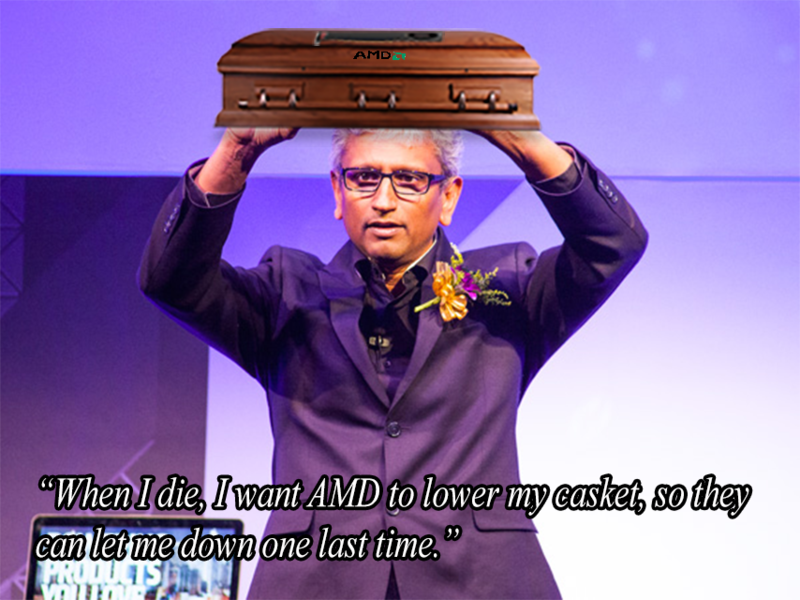 Its the fault of the Tech Sites(like TPU..hehe),the tech youtubers..& the AMD's Toxic Community is to Blame..
its always their fault.. for hyping things & in the end ..getting AMD's a$$ burnt. I know, but still those are fine for eSports games or older titles with lower graphics settings. I miss those old days when that slower card had a SE or something in its model name, it was easy to know which was the slower one.